Villa Shambhala Turks & Caicos. 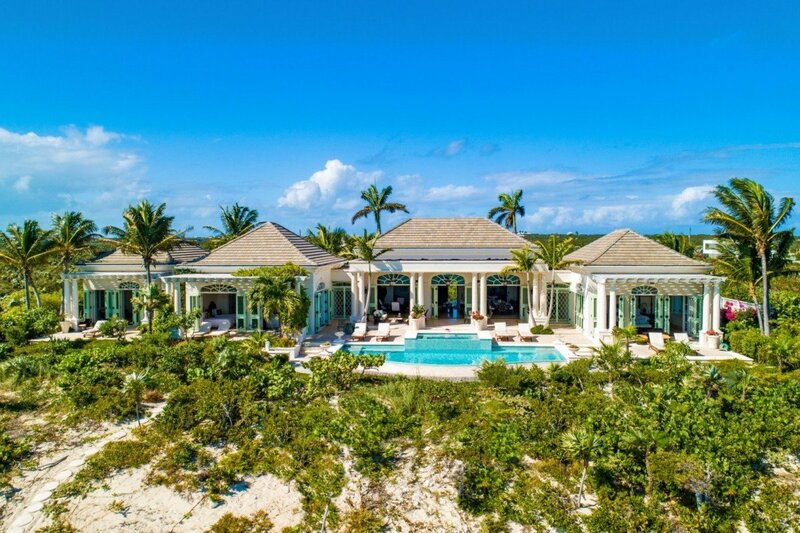 Situated along Long Bay Beach in Turks & Caicos, the lovely and elegant Villa Shambhala has been designed with flawless style and charm. With its pale palette and charming shutters, this property is an idyllic getaway and destination all on its own. The front of the villa faces the sea, and is just steps from the lovely white sands of the beachfront. The scene is perfected by the swimming pool terraced, which is a stepped beauty offering a plunge pool as well as a larger swimming pool. Surrounded by the terrace, it is framed with a columned portico and several open lounge areas. Dine in the al fresco barbecue area, lounge on the comfortable porch furniture, or step inside to the stunning great room. This high ceilinged beauty has been decorated in classic Caribbean style with a neutral palette accented by pops of darker color provided by the elegant furnishings. The great room offers a formal dining area, two lounges and a breakfast bar leading into the gorgeous, gourmet kitchen. Because the entire space is open to the scenery, you will feel the touch of the trade winds even as you make a meal or whip up a few cocktails. An entertainment room also ensures even more living space and room to relax in peace and tranquility. The five bedrooms of the villa offer two master suites with king beds, private gardens or terraces, and exterior showers. There are two double suites with ensuite baths, and a larger queen suite also ensuite. The Villa Shambhala surrounds you with privacy, scenery, and fine amenities. You can use the kayaks along your private beach, spend hours by the pool, or gaze at the stars from the terrace. Just 15 minutes to town, it provides an unbeatable location for an unforgettable experience of Turks & Caicos. Note: Shambhala offers an A/C allotment of $450; most guests do not exceed this amount. Any overages are charged back to the guest at cost. Bedroom 1: Master bedroom with a king-size bed, A/C, ceiling fan, Phone, safe, sound system, private garden deck and en-suite bathroom with bathtub, interior and exterior showers, vanity and WC. 2 guests maximum. Bedroom 2: Master bedroom with a king-size bed, A/C, ceiling fan, Phone, sound system, private garden and en-suite bathroom with bathtub, steam shower, exterior shower, vanity and WC. 2 guests maximum. Bedroom 3: Bedroom with a queen-size bed, A/C, ceiling fan, Phone, sound system and en-suite bathroom with shower, vanity and WC. 2 guests maximum. Bedroom 4: Bedroom with two single beds (can be made up as a king-size bed), A/C, ceiling fan, TV, DVD player, Phone, sound system and en-suite bathroom with shower, vanity and WC. 2 guests maximum. Bedroom 5: Garden level bedroom with a double bed, A/C, ceiling fan, Phone, seating area, kitchenette and en-suite bathroom with bathtub, shower, vanity and WC. 2 guests maximum.